This particular study above was designed by Kelly Toole, Interiors of New Albany, Ohio. Through the years we have done many home offices, this particular project was designed by Kelly Toole Interiors of New Albany, Ohio. 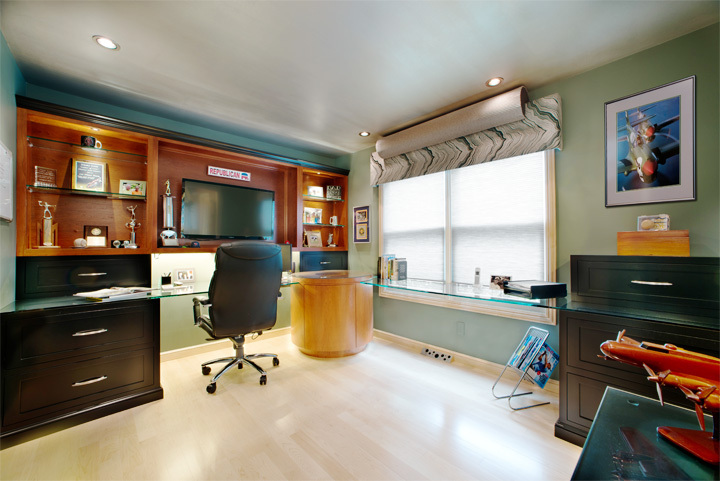 The mixture of Cherry wood and black painted cabinetry really made this office “pop”. The rounded cabinet in corner was venneered in cherry and has a convex shapped door that reveals computer and other items. The floating counter tops are 1/2″ glass.